For many students who encounter Certeau, it’s this text of his that they read, and within it, the essay “Marches dans la ville,” or “Walking in the City,” is no doubt the most widely assigned section of the book. The Practice of Everyday Life, and especially this essay, struck me mightily when I first read it. For me, Certeau’s work is helpful to make sense of the ways in which people are exposed to, consume, and reproduce “narratives” and “texts” in their everyday activities and speech acts. His ideas are rich and provocative, and deeply interdisciplinary, if also a bit dense and at times abstruse. But he’s remained with me over the years. And I’ve been walking lots and lots lately. So I thought I’d revisit him this morning! 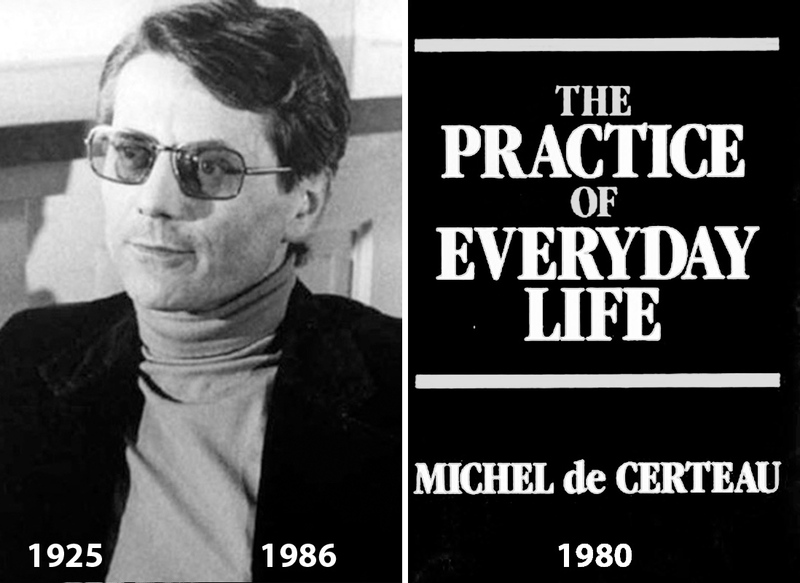 For Certeau the essays in The Practice of Everyday Life form an extended exercise in understanding human “ways of operating,” stylistically and functionally. That is, this book tackles the thorny issue of being, by asking what enables people to exist in the world, and social formation and conditioning, by asking how social experience (re)produces various forms of communication. In sketching out nuanced social theories that draw upon psychoanalysis, sociology, and phenomenology, Certeau writes about what he famously called the day-to-day “strategies” and “tactics” of people in the negotiation of power relationships inherent to human environments. For most people tactics are dependent upon the space they inhabit; tactics of all sorts represent individual opportunities to manipulate cultural associations within given places in an effort to loosen the totalizing order of the dominant society. The most vital and defining characteristic of an everyday practice, such as walking, is its tactical mobility. As societies are evermore inculcated by totalizing socioeconomic orders, the ways in which people resist disciplines and “governmentalities” are the foci of Certeau’s essay “Walking in the City.” It’s interesting to note that the people about whom he writes, and indeed those to whom he dedicated the book, were ordinary folk: the common and omnipresent characters, the walkers, who blaze an incalculable grid of paths through city streets. Why does Certeau study these people (to varying degrees each one of us is included) in this essay? By writing about walking as a tactical modality, Certeau attempts to identify creativity and intelligence among the oft-presumed powerless people in the historically lopsided social relationships between governments and their subjects, between big business and consumers. To walk in the city is to carve out, if only momentarily, one’s own “space” in the “place” otherwise designated by civic architects and institutions. “On the one hand he actualizes only a few of the possibilities fixed by the constructed order (he goes here and not there), on the other he increases the number of possibilities (for example, by creating shortcuts and detours) and prohibitions (for example, he forbids himself to take paths generally considered accessible or even obligatory). He thus makes a selection” (98). The selections the ordinary person, the walker, makes thus tactically subvert the panoptic, totalizing authority that for the most part determine what happens in the lives of ordinary people. Certeau is calling us to arms, however, to recognize the manipulation of our everyday lives and to revolt. His is a more subtle appeal, perhaps best illustrated by what he calls la perruque (“the wig”) – the act of a worker who steals company time – i.e., fleeting moments – and turns them into “circumstances” for his/her own entertainment and/or benefit. An example he gives is when a man or a woman writes a love letter while technically, and outwardly appearing to be, on the job. Only the employer’s time is stolen, but in the end corporate profit is undercut. For the employee, stealing this time while at work is a sort of “micro-resistance” within a normally overpowering and unequal relationship. Moreover, an opportunity has thus been created which brings into being a sort of “micro-freedom” for the ordinary person. This isolated freedom (it’s actually an ongoing process of seizing “opportunities,” whether through walking, reading, etc.) exemplifies the type of fracture that can be created in the panoptical superstructures within which we live. “Walking in the City,” then, offers a glimmer of hope for humanity amid an often-overwhelming and dominating system of operations. Certeau’s report is indeed even playful and communicates a localized vision of ambition and invention. It is his “phatic” attempt to infuse into our (university students and scholars, especially) quotidian thinking that, as he says elsewhere in The Practice of Everyday Life, “it is always good to remind ourselves that we mustn’t take people for fools” (176). This reminder seems especially pertinent nowadays when political campaigning and punditry bent on spinning information in obviously erroneous ways seem to occupy enormous amounts of the airwaves and internet. A takeaway for me in all of this, minor though it may be, is the basic differentiation of spaces and places in my life. Can I perceive them? How do I create my own spaces? How do I negotiate the places in which I travel, those settings that have been created by others into which I enter? I see space (espace) in Certeau’s work as composed of intersections of mobile elements; it is produced by the operations that “orient it, situate it, temporalize it, and make it function” (117). Place (lieu), on the hand, is a register within which objects are distributed in “relationships of coexistence”; elements therein are defined by their location, i.e., adjoining relation to other elements. This entry was posted in Academics, Language, Society on 12 November 2012 by peashoot.